A few years ago, I led a small group of tourists to Oaxaca, Mexico for the Dia de los Muertos (Day of the Dead) festival. Following that, I spent a few days in Mexico City where I rode in a gondola through the raucous party-on-the-water in the Xochimilco canals. 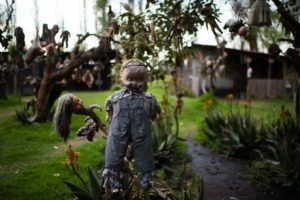 But, in all that Corona-swilling, mariachi-playing craziness, the Isle of the Dolls is a creepy, haunted site that chills the bones of even the most inebriated reveler. 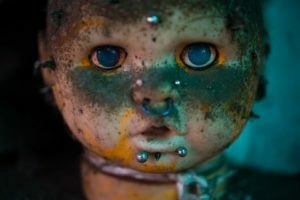 I know it chilled my bones and I’ve visited some damned scary places around the world. 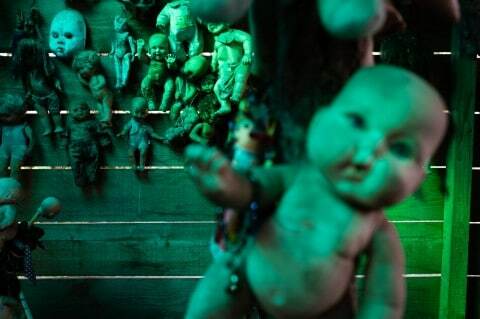 “The dolls are nailed to walls, nailed to trees, beheaded and impaled on bamboo stakes. Some are headless, some are heads alone, and some have heads that are twisted around backward, “Exorcist”-style. They are muddy, filthy, burned and smashed. They look back with blue eyes or brown eyes or no eyes at all. A blond Disney princess in a blue dress smiles, tacked to a wall. A plastic knee swings in the wind. 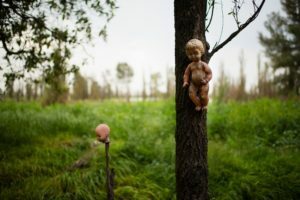 The Island of the Dolls is muddy and smells faintly of manure from the surrounding cow fields. It is not a happy place, but it attracts a steady stream of the curious, who disembark from party boats plying the 50-plus miles of Mexico City’s famed Xochimilco canals. Anastasio Santana will tell you the story for $2. 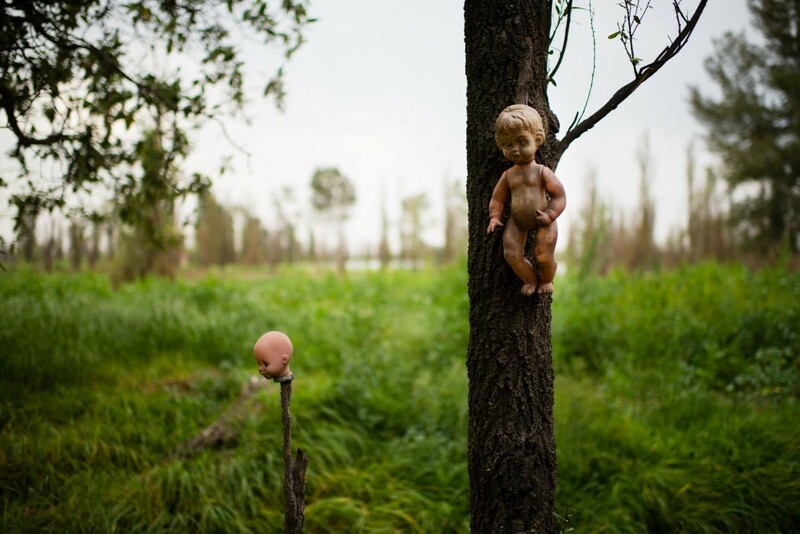 After his uncle, Julian Santana, found a drowned girl here in 1950, a doll washed ashore. He hung it up to appease the dead girl’s spirit. But then some pretty unpleasant haunting started, and Julian began hanging more and more dolls from the trees to ward off the spirits of lots of dead girls. 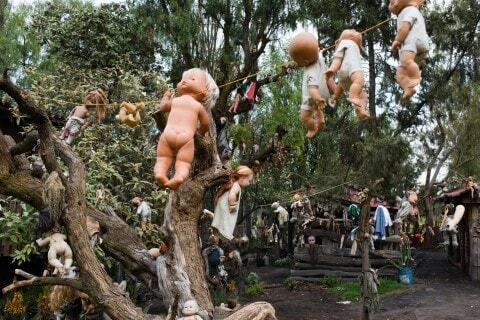 Now, 2,200 dolls later, La Isla de Las Munecas has become a touristic monument to creepiness and kitsch, visited, presumably, by true believers. 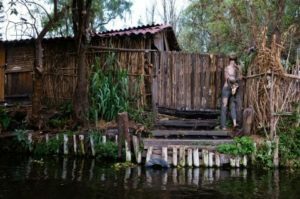 But maybe more often by happy party-boaters filled with $1.50 Coronas who don’t mind paying $2 to be stared down by a mud-stained Betty Boop on an island that also happens to have remarkably clean outhouses. 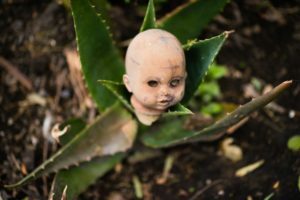 Julian Santana died of a heart attack in 1951, in the exact same spot as the little girl of island lore. “We can’t explain it,” Anastasio says. Hola John, Ayyyy! Hope you got a “limpia” after that adventure! Sorry to have missed your visit in CDMX. Hola, Catherine! Yes, I’m sorry we couldn’t connect on that trip, but I hope to visit again sometime. 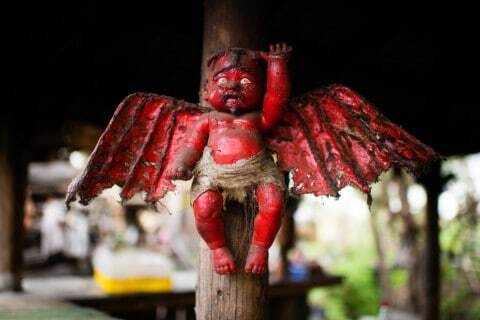 Hmmm, I probably should have consulted a curandero!